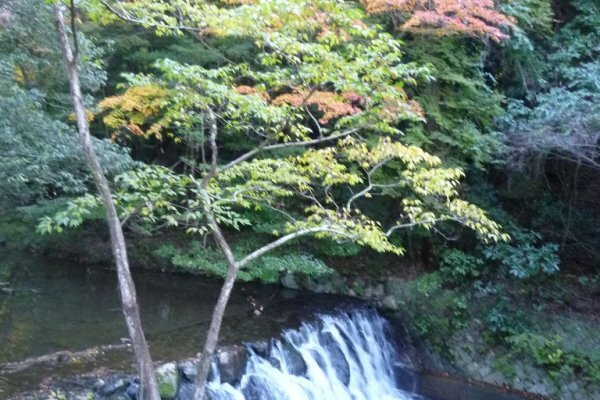 With spring coming along and the weather getting warmer, the perfect place to head to in Osaka is Minoh Park, conveniently located on the northern part of Osaka and less than 30 minutes from Umeda on the Hankyu Takarazuka line. 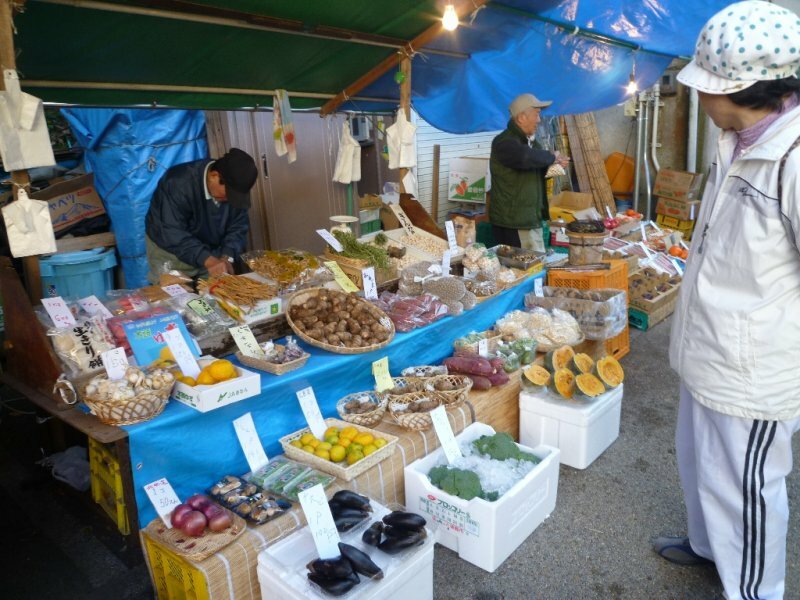 Especially on weekends, many people come here to enjoy walking on the main paved trail: Takimichi. 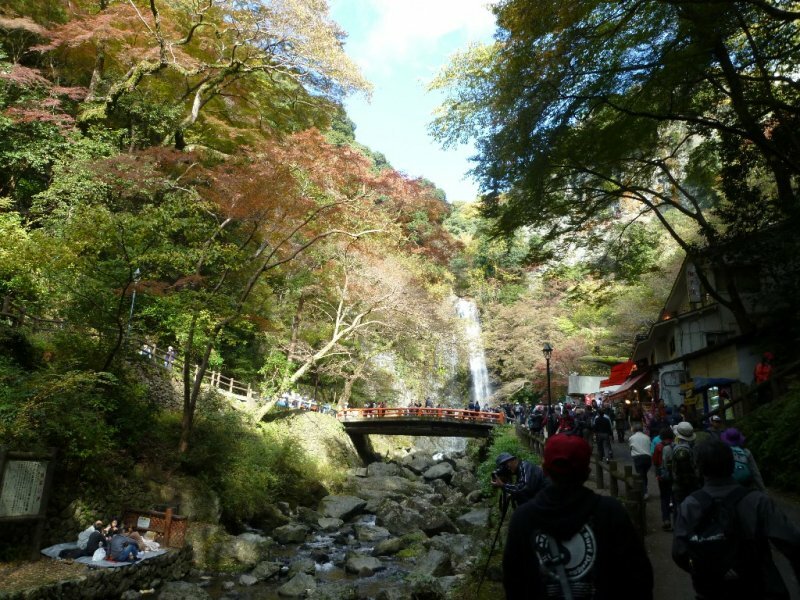 Built around 1886, Takimichi is a walking trail which leads to one of the most famous spots here, the Minoh Waterfall (Minoh Taki). There are actually a few ways to enjoy the hike. 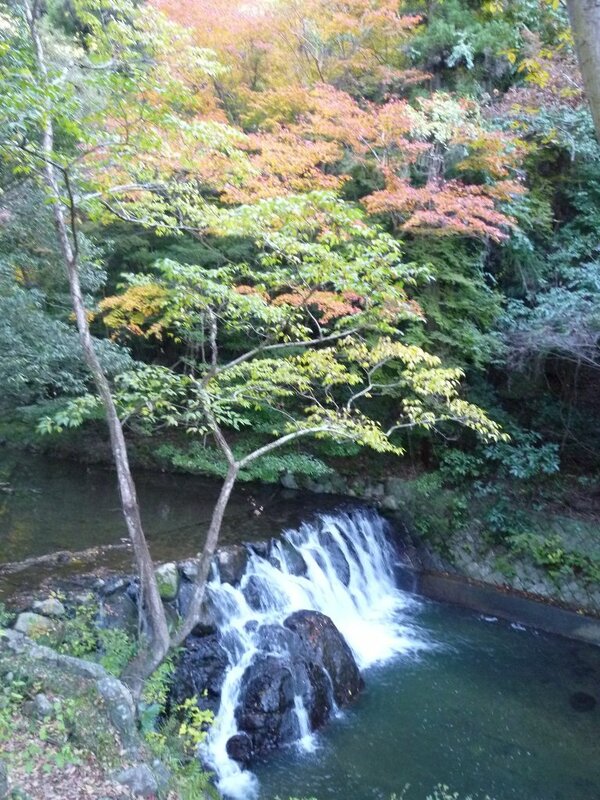 I would recommend at least walking up to the end to Minoh waterfall, about 2.7km from Minoh station. This is, literally, a stroll in the park, as the elevation is not steep. In addition, there are a few interesting photo spots on the way to the waterfall that are worth stopping by. Upon arrival at Hankyu Minoh Station, you will spot the Momiji hot spring footbath (ashi-yu) just beside the station. 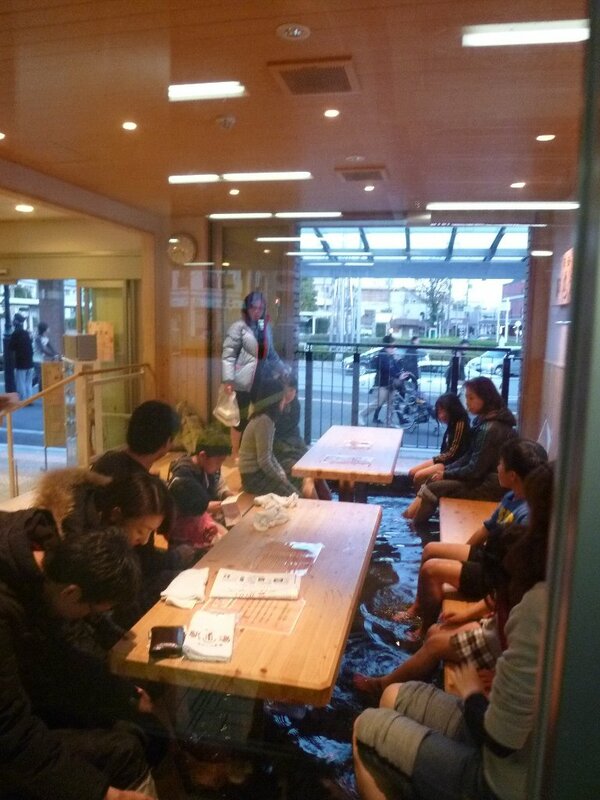 The footbath is open from 10:00 to 16:00 and costs only 150 yen. You will get a small towel to wipe your feet. This is the perfect place to go to on your way back after a long walk around the park. The entrance to Takimichi is right in front of the Minoh Station. 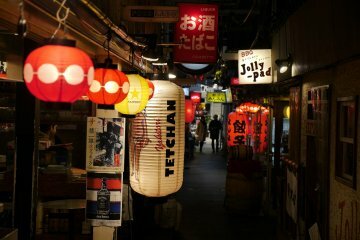 You will see rows of souvenir shops and restaurants at the entrance. Minoh is also famous for its Momiji Tempura, maple leaves fried in a sweet batter with sesame. 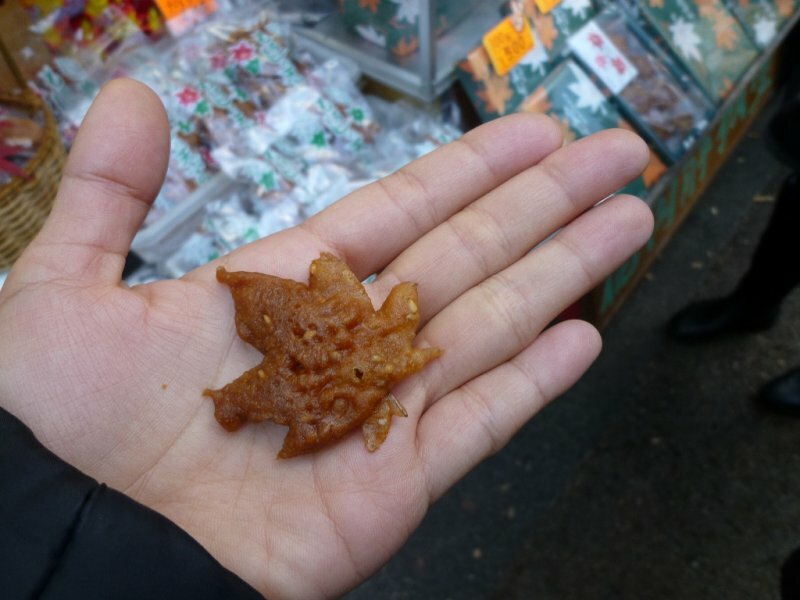 Maple leaves may not sound like something you want to put in your mouth, but it is just like any other crispy cookie and serves as a great snack while walking through the park! 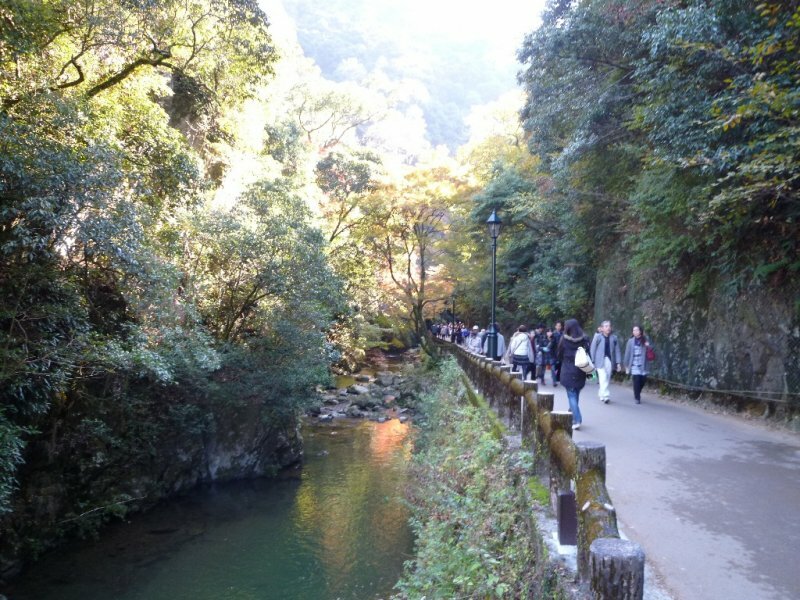 The Takimichi trail is built along the stream. In spring, it’s delightful to see young budding leaves and cherry blossoms. 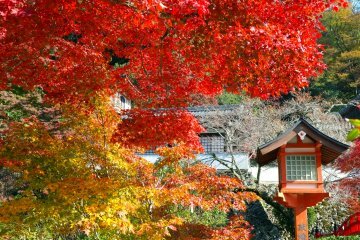 Minoh is also famous for its autumn leaves, with foliage of red, orange and yellow. 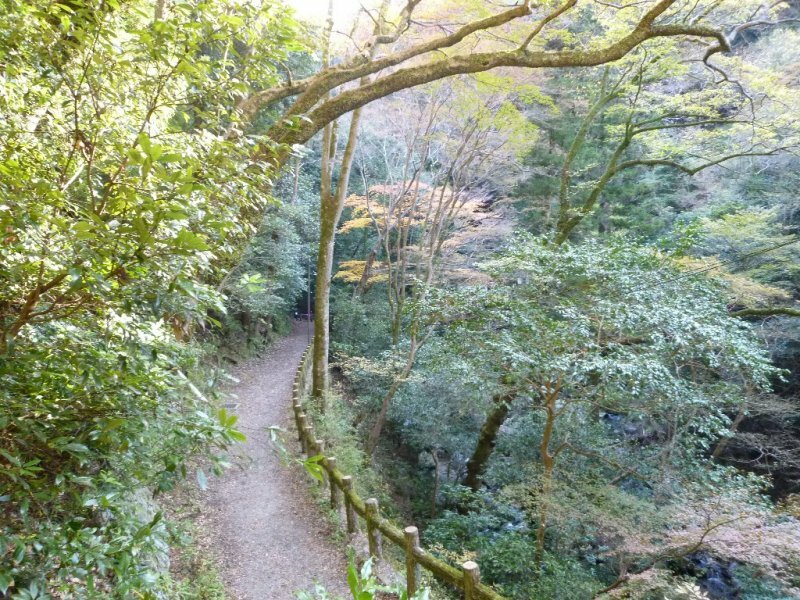 Here, you can see various trees like the Japanese cedar, cypress, maple and cherry on both sides of the trail. If you come on a sunny day, with all the shade from the trees, you will barely feel the heat. There are rest houses and benches by the trail for you to take a rest and spend time with yourself while enjoying the beauty of nature. 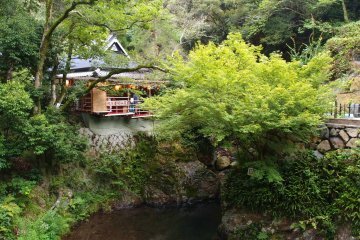 Another stop on the Takimichi trail is Hashimoto-Tei, a café/restaurant with a small craft gallery. This is the first wooden building on the Takimichi trail, just at the foot of the first bridge, Ichinohashi. 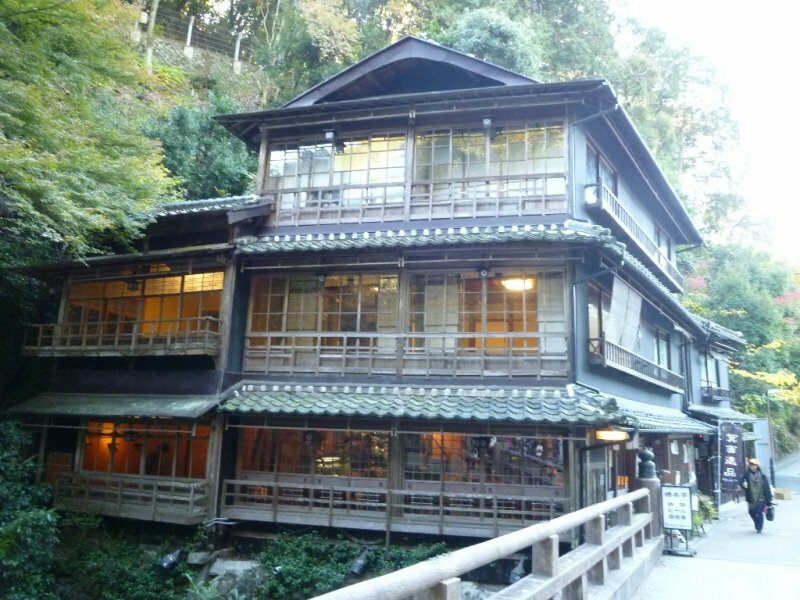 Hashimoto-Tei is actually a Japanese inn (ryokan) built in 1910 during the Meiji period. 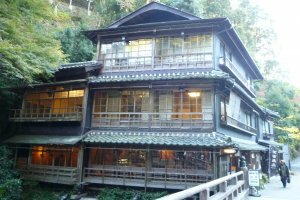 Although it doesn’t operate as a ryokan anymore, it is worth it just to come for a cup of coffee and enjoy the scenery from this 100-year-old architectural wonder. One day I arrived early so I decided to drop by for breakfast. 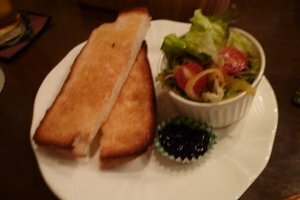 I tried the shop’s trademark food, a simple but delicious butter toast with blueberry jam. 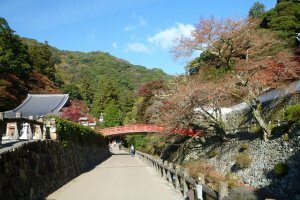 As you continue walking on Takimichi, just before you arrive at the third bridge you will see the Minoh Insect Pavilion on your left. 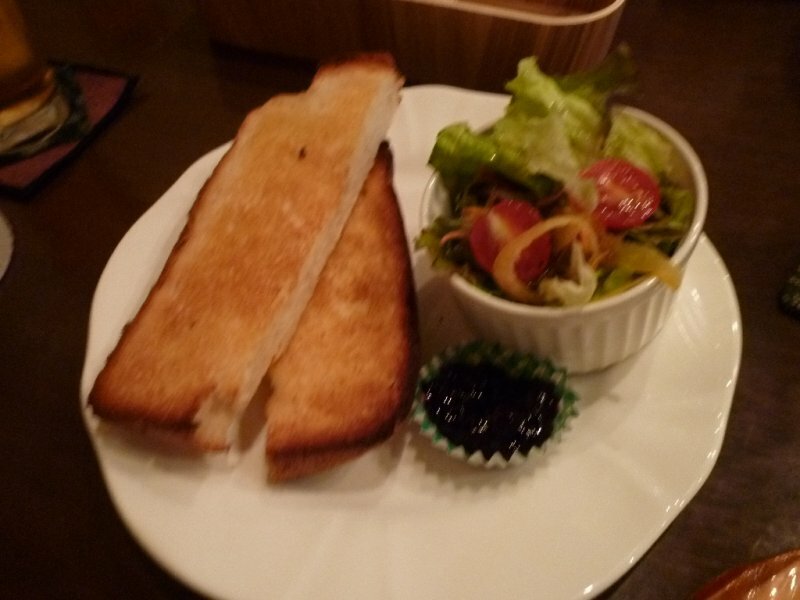 Entrance is only 270 yen for adults and free for junior high school students and younger. 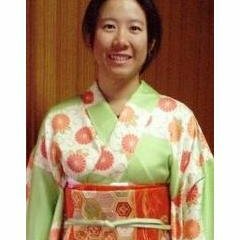 It is not a big museum but worth a visit if you want to know more about insects in Japan. There is also a butterfly park to the Insect Pavilion. 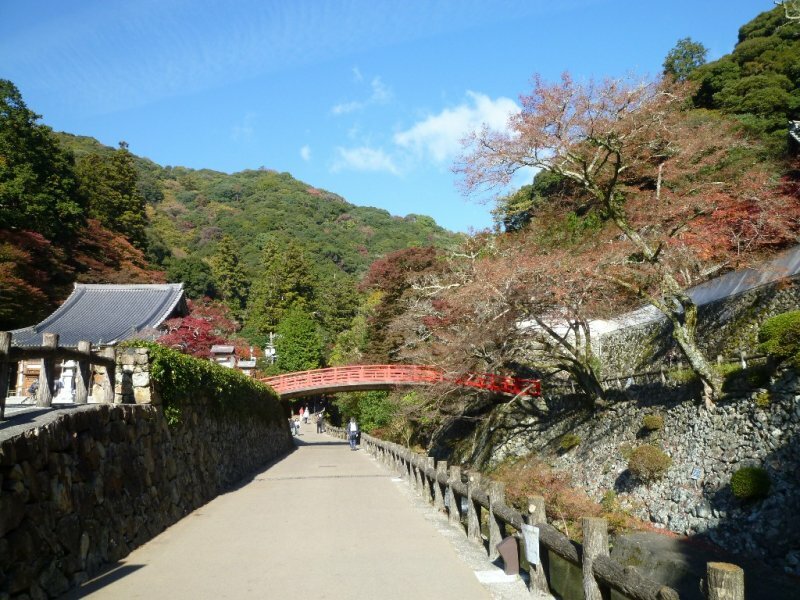 After the Insect Pavilion, you will see Ryu-an-ji, a temple with a red bridge just across the path. This is one of the oldest Shu-gen-do temples in Japan. Shu-gen-do incorporates different aspects of Taoism, Shintoism and Buddism. Ryu-an-ji is also known as the Tomi-kuji (Prosperity Temple). For those out there who is looking to win your next lottery, why not drop by this temple to pay your respects? Now, almost halfway through the Takimichi trail, if you are lucky, you’ve probably spotted monkeys or hear them calling out. 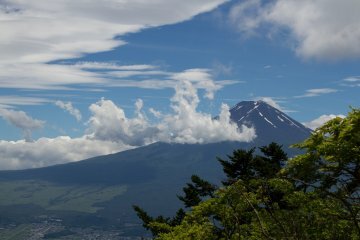 Minoh Park is actually a Quasi-National Park. 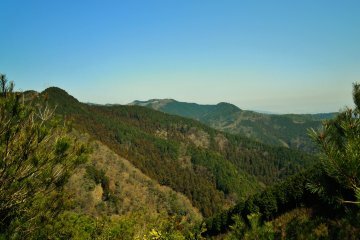 It was said that when the Minoh Zoo was abolished in 1977, the monkeys were let free to roam in the mountains. As you approach to the final part of the trail, you will see a tall 7.5m gigantic rock. 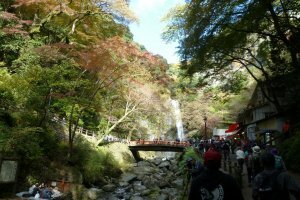 It is said that rich merchants from China came to Minoh to see the beautiful waterfall, only to be frightened by the big rock and decided to turn back in fear of their safety. 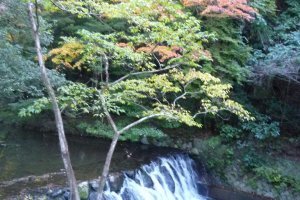 But don’t be afraid--seeing this rock means that you are nearer to the Minoh waterfall! When you arrive at the 33m falls, you will see a bridge which is the perfect spot to take your picture. Try to go nearer and see if you can spot beautiful rainbows shaped from the rays shining into the curtain-like waterfall. It is also very refreshing to take a rest on one of the benches in front. 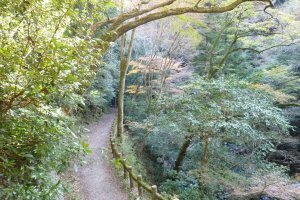 If you are still wanting for more greenery and adventure, there is a 4-km hiking trail from the waterfall that leads to Katsuoji Temple. “Katsu” means “to win” in Japanese and it is said that worshippers come here to increase winning luck or to have their wishes fulfilled. 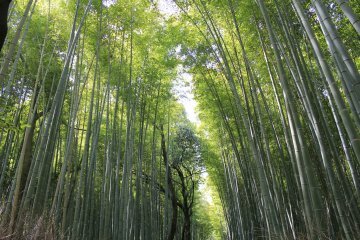 Minoh Park is the perfect place to spend a pleasant day amongst the trees and nature. 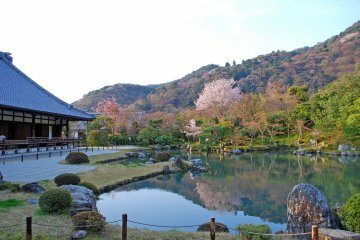 A stroll in Minoh Park will surely leave you refreshed. And oh yeah, don’t forget to drop by the foot bath at the station before heading back to town! Nice article! 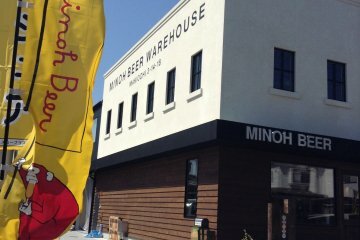 I've lived in Minoo too and this sure brings back memories! I almost forgot about the monkeys; one of those rascals even stole our lunch one time!